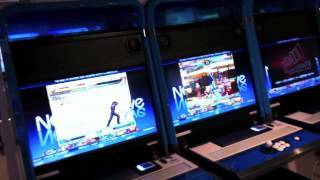 Quick Look into a Japanese Video Game Arcade Persona Ultimate, Radiant Silvergun, Ikaruga, More! Arcade mode (XBLA), Normal (Stage 2 route) Score: 7,268,440 Stage 3A - 00:02 | 3B - 01:10 | 3C - 03:44 | 3D - 05:51 | 3E - 07:28 Stage 2A - 10:16 | 2B - 12:08 | 2C - 14:44 | 2D - 17:05 | 2E - 18:11 Stage 5A - 20:18 | 6A - 23:27 | 1 - 27:05 This is my first (and, so far, only) 1cc of this game. (I haven't really played it since.) I got this run quite a while ago (the day after the game was released on XBLA), but I never got around to capturing and uploading it until now. I haven't put a huge amount of effort into this game, so I don't go for a lot of scoring opportunities. This is pretty low for a clear score, really. (It's essential to do some scoring, in order to get weapon levels high enough to be able to handle the later stages.) Maybe if I get back into this game, I'll try the stage 4 route, which scores a lot higher, but is harder. It's a fun stage, though. As for the run itself, three of the four deaths were pretty stupid and easily avoidable. I didn't really bother trying to chain 3C, and I messed up the chains a little bit in other places (notably 2E), but otherwise I think I did alright in the first two stages. I don't even bother really chaining in stage 5, as survival alone is hard enough for me on that stage, but amazingly I managed to no-miss that stage. I have a feeling the homing lasers at the start of stage 5 behave a little bit differently in this version, so I used a different approach to them compared to usual (that is, actually pay attention to them), and somehow it worked. After that, Xiga taking me down to my last life made me a little nervous (especially with one of the deaths being really dumb), and it wouldn't have been the first time a run ended within seconds of clearing. Fortunately that didn't happen this time, and I actually think the higher resolution on this version helped me dodge stuff. It took me a little while to adjust to the 360 controls (coming from keyboard with emulator); I had lots of fun fumbling buttons during my first runs. (The game has 7 weapons, and each weapon is assigned to its own button. Fortunately, the weapons are all accessible by combinations of 3 of the buttons, which is how I was used to playing it anyway. I always use the dedicated button for the sword though.) The D-pad is still inferior to the keyboard, and while that usually doesn't cause me any problems, the difference is noticeable when I try to use the sword, for instance. The XBLA version has some graphical glitches and other minor issues, and it doesn't have any slowdown (bad). As far as I know, the Saturn version is perfect in these regards. The XBLA version does have replays and a good stage practice feature, which is a big plus. Blah. ABC news channel 7 Los Angels did a five part series about the arcade video game indusrty. This was transfered from a VHS tape that we recorded in 1982. We were 8 years old operating the VCR back then so some of video gets cut out. 栃木県、那須にある千本松牧場内のゲームコーナーにあるレトロゲームをレポートします。子供向けの遊具・乗り物の奥に２０年以上前のビデオゲームが残されています。貴重な大型筐体を遊ぶことができる貴重なレゲースポットです。 詳しくは、OBS・基板大好きへどうぞ→http:onitama.tvobswebpcb.htmlOBS reporter 'onitama' introduces Senbonmatsu farm's old arcade in Tochigi, Japan. Coming up following game machines, Super Chance, Thunder Blade, Line of Fire, Star Blazer, A.B.Cop, Winning Run Suzuka GP, Final Lap 2, Continental Circus, S.C.I. and Ground Effects. Today I play some arcade games at the Skylon tower arcade in Niagara Falls Canada! While I'm playing the "Shuffle Shack" arcade game, a weird automated voice keeps telling me to collect my tickets!► Arcade Warrior SHOP http:arcadewarrior.spreadshirt.com► Second Channel: https:www.youtube.comuserJustErik...► Facebook: https:www.facebook.compagesArcade...► Twitter: https:twitter.comArcadeWarrior► Instagram: http:instagram.comthearcadewarrior► Google+ https:plus.google.com+ArcadeWarriorFAN MAIL! Arcade Warrior PO Box 342 N.Chili, NY 14514 United States of AmericaMusic used in the video. Track: Fade - Alan Walker [NCS Release] Music provided by NoCopyrightSounds. Watch: https:www.youtube.comwatch?v=bM7SZ5SBzyY Free Download Stream: http:nocopyrightsounds.co.ukvideoalan-walker-fade?download=1Subscribe For New Videos Every Tuesday & Friday! Composer: Hitoshi Sakimoto Copyright(c)Treasure ESPDisclaimer: I do not own anything. With the promise of grilled hamburgers and hotdogs, and lots of arcade fun, Todd is invited to our customer Ben's SUPER ARCADE PARTY last Saturday! Join us as we have some FUN in his home game room with his friends! I talk about some of the most rare and or valuable games I own in my entire video game collection. At the end of the video I highlight what I believe to be the current 10 rarest games I own. I can't show everything, but I chose a select few I thought were worth mentioning. I have also decided to leave out games I own that are signed, maybe for a future video. This is a video reply to Josh "GamezOfWar" and his "Rare Gaming Items I Own" video.Join me on Facebook: Profile page (Subscribe): http:www.facebook.comprofile.php?id=100001792196407Fan page (Like): http:www.facebook.compagesPeteDorr179988468693819Follow me on Twitter: http:twitter.comPeteDorrListen to my Podcast All Gen Gamers with co-hosts Gamester81, TheEMUreview, and MetalJesusRocks: http:allgengamers.comAllGenGamers YouTube Channel: http:www.youtube.comuserallgengamersVisit my website: http:www.PetesGameRoom.comJoin the Forum Community: http:www.PetesGameRoomForum.comWatch me live on my Twitch.tv channel: http:www.Twitch.tvPetesGameRoompetedorr "pete dorr" "my video game collection" "rarest games I own" "most valuable games I own" "rarest games in my collection" "petes game room" gamezofwar "rarest video games" "most expensive video games"